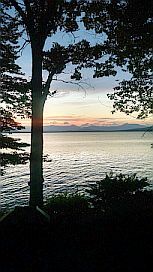 Ossipee Lake House: at the edge of Ossipee Lake & only a few steps from wading in its waters. Magnificent views from the deck--full view of the lake and mountains from the deck. Gentle slope of smooth sandy lake bottom, seen at low lake winter level, extends 100s of feet. 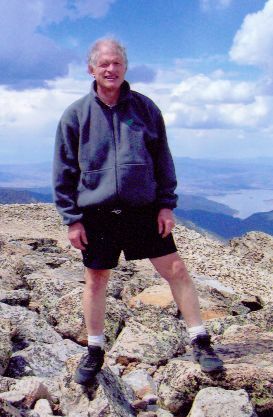 with White Mountains seen on other side. at the edge of Ossipee Lake. Driveway to front provides convenient access and ample parking in serene setting. Great room extends from kitchen to magnificent fieldstone fireplace -- lots of room for everyone. Great room features two stories of windows providing spectacular views of the lake. Great room with its fireplace and two of the sliding glass doors in the wall that opens to the deck. overlooks lake next to screened porch. Master BR suite is one of 5 BR plus bunk bed room, beds to sleep 12 comfortably. expansive front lawn to forest. Tranquility extends into the evening -- listen to the loons from the deck or through the sliding doors. Spacious smooth naturally sandy gentle lake bottom extends 100s of feet into the lake for comfort and safety -- not the rocky bottom or steep drop-offs found at other locations. No lake house is closer to the water -- relax in lakeside serenity in this modern and spacious 4200 sq. ft vacation villa. Besides wading, swimming, boating, water skiing, fishing, and other water sports it is close to golf, tennis, hiking, skiing, snow boarding, ice skating and excellent dining. Features large deck next to water with stunning lake and mountain views including a screened porch with propane grill allowing grilling even if it rains. Fully furnished and equipped vacation home. Indoors has 20 ft ceilings in huge great room with fieldstone fireplace with two stories of windows overlooking lake and views of mountains. WiFi, Cable Television with large flat panel screen and over 250 channels, including ESPN. Beds for 12 guests in 5 bedrooms and a bunk bed room, 4 bathrooms (we supply shampoo, conditioner, body wash). Exercise room with professional quality equipment: cross-over cable machine, Olympic weights and rack, Concept 2 rower with updated electronics. Refrigerator with through-the-door ice and water dispensing. Microwave, coffee maker, toaster, waffle maker, Crock-Pot. Dishwasher—we supply detergent for sink and dishwasher and paper towels. Jenn-Air indoor grill and griddle in the island counter. Full sets of dishes, drinking containers, wine glasses, cookware, flatware, and utensils. Refer to Ossipee Lake House Amenities for additional information. Propane grill on covered screened porch for year-round grilling in any weather. Washer and dryer—we supply detergent. Your water comes from our exclusive private deep rock (artesian) well, not lake water, and is double filtered to provide clear refreshing water without added chlorine or fluoride. Year round pleasures include summer water sports (swimming, boating, water skiing, canoeing, kayaking), fall's gorgeous foliage colors, and winter skiing close as 10 miles (about 15 minutes) away and ice skating and snowmobiling out the door of Ossipee Lake House. Our family and friends have wonderful memories of our times at our lake house. Now, we are renting our Ossipee Lake House so that you, your family, and your friends can make your special memories at what will be your lake house. We have spent Christmas, Thanksgiving, 4th of July, anniversaries, birthdays, and just relaxing days and nights at this very special place. This remarkable lakefront location has a naturally sandy bottom that gently slopes from the shore for hundreds of feet. It has been kid and grandkid safe and inviting.